Avalanches: WL-N-D2.5 (from March 18th?) on a steep, cliff-laden SE aspect ~12000′, debris confined by gully, ran ~2,500′, gouged out old snow and produced some small crowns on the sides of the gully. 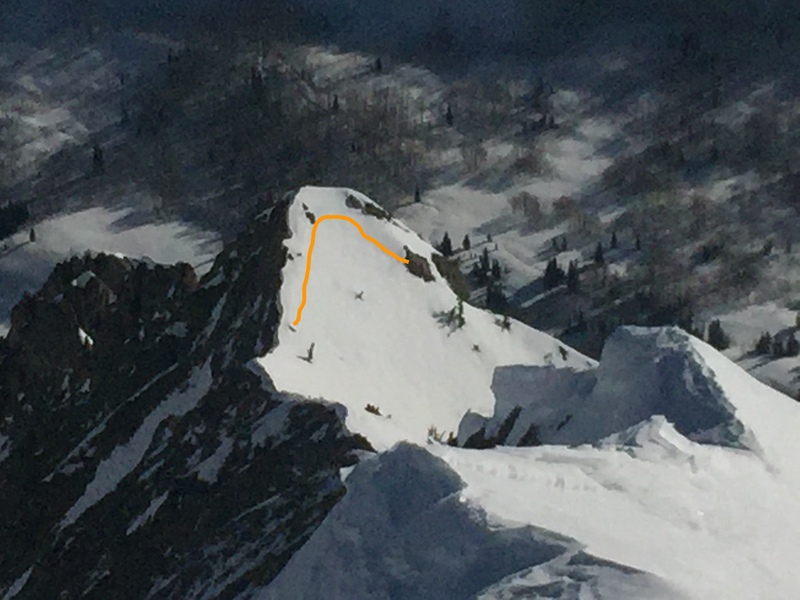 I don’t think this was triggered by cornice fall and although I could not make out a crown from my vantage points, this may have been a wet slab rather than wet loose avalanche. Snowpack: The transition to a spring snowpack is well on it’s way, but not yet very dependable. The window of good corn skiing was pretty short-lived on sun-exposed slopes before the crust softened and ski penetration got deep today. Water was running over ice bulges on steep east-facing slopes between 11,500′ and 12,000′ @9:30am. I also noticed a significant crack on a high-elevation SSW-facing slope. I agree that the wet slab concern is growing. Meanwhile, it’s still dry and “chalky” on high-elevation (>12,000′), shaded northerly slopes. Stiff, supportable crust lasted until at least 10:30 am on the valley floor of Washington Gulch, but snow in the dense forest barely refroze overnight (moist snow surface at 7:30am @ 10,000′). Stay away clouds!